With the year almost over, it seemed interesting to see where weather stations stand in regards to how warm, cold, wet, or dry it has been throughout the year. Part one of our analysis looked at rainfall for the United States. In part two, we break down temperature statistics for the 2018 year. Preliminary reports show global temperatures are most likely to be in the top 5 on record. In the United States however, it will probably be lower than that. This is due to much cooler than normal conditions in the upper midwestern parts of the United States. This map, provided by NOAAs National Centers for Environmental Information provides a year-to-date analysis (up to November) describing the state of the climate for the country. It’s a fun animation to watch, but doesn’t really help put the year’s temperature into a climate context (plus some will say there are way too many colors on the map). It’s usually cold in the winter time and warm in the summertime. Nothing groundbreaking. But, by calculating a departure from average, we can see how unusually warm or cold it has been in the area. Typically, an average is defined as a 30 year period, so in this case we compute an average between 1981 and 2010. This second animation shows the departures from normal for each day so far in 2018. Like the NCEI image above, reds indicate warmer than normal, and blues cooler. There is a lot of day to day variation in the data, along with certain spatial components. At the end of the year, this information is averaged up, and a single map will be used to determine the overall state of the temperature for the year. But that doesn’t stop us from taking a sneak peek. Have at least 40 years of data. Have good data between 1981-2010 (to calculate a 30 year climatology). Have 90% of days reported in 2018. At the time of writing, data is available up to December 14th, 2018. What is the hottest and coldest station? By using straight temperature values the warmest station is Death Valley, CA (81.8 degrees fahrenheit) and the coldest is Utqiagvik (Barrow), Alaska (18.4F). But remember that it’s better to use departures, rather than absolute temperatures. When comparing against a 30 year normal, the top 5 coldest and warmest are as follows. Three of the 5 warmest stations is Alaska, who is on pace to have a record top 5 year. Utqiagvik (Barrow), Alaska cracks the top 5, which is interesting, given it’s one of the coldest stations with an annual average of 18.4 degrees so far. This is a good example of weather versus climate. Weather is what is happening now, and climate is a long term average of weather. To put it in a different perspective: weather is your mood, climate is your personality. The map below shows the daily temperature time series for Utqiagvik. It usually is very cold, but when we compare 2018 (18.4 degrees) to what is average (12.9F), then we can say it is warmer than normal. As expected, the coldest stations lie in the upper mid west. The top 5 stations occur in the Dakotas, Kansas, and Montana. 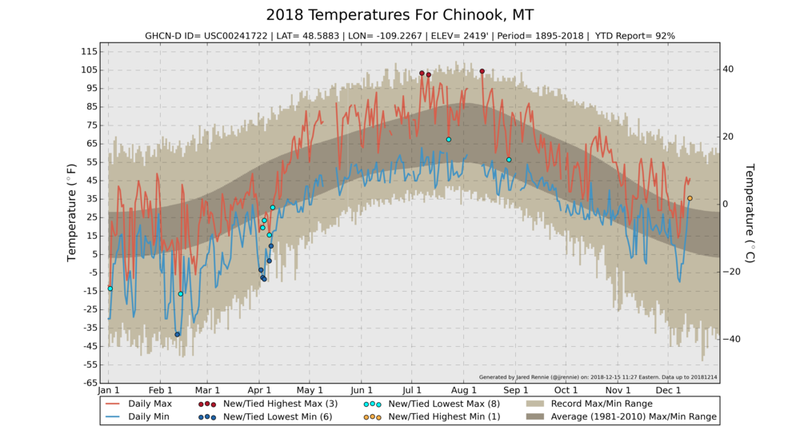 The coldest station is located n Chinook, Montana, whose first half of the year saw really cold temperatures. Periods of February and April were below freezing overnight, and on the morning of February 11th, the morning low was a whopping -38F. Brrr! Where were Daily Records Broken? 421 Stations with more than 10 days broken (56 more than 20). 370 Stations with more than 10 days broken (10 more than 20). 855 Stations with more than 10 days broken (242 more than 20). 123 Stations with more than 10 days broken (2 more than 20). Records are typically broken each year, both on the warm and cold side. But the information above shows there are many more warm records broken than cold. The most staggering difference can be seen in nighttime temperatures. There were 2 stations (Edgemont, South Dakota and Jackman, Maine) that saw more than 20 nights with a tied or broken cold record. However there were nearly 250 that experienced a warm record overnight. They are scattered all over the United States, as can be seen below. This is consistent in literature that says nighttime temperatures are warming faster than those during daytime. 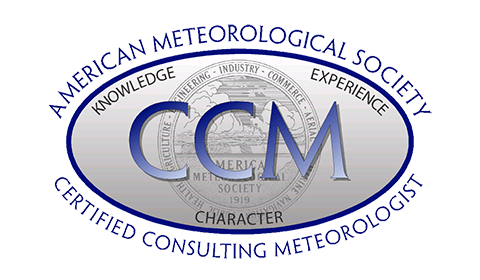 In our final segment, we will provide updates to the temperature and precipitation records (once they are official in January), and we will also look at some important weather events that occurred in 2018.